If you require a room size that is not listed on this page,please drop us an email to sales@modularcoldrooms.com with your requirements. We can supply and fit rooms as large as 20m x 20m. We offer the complete service including installation for a small charge. We have a huge selection of racking available. GET IN TOUCH by email/telephone or Live chat! If you are thinking of placing your room externally outside,get in touch , our rooms can go outside with additional weatherproof housing. A complete room, with a panel thickness of 80mm. Including an anti-slip pedestrian floor. 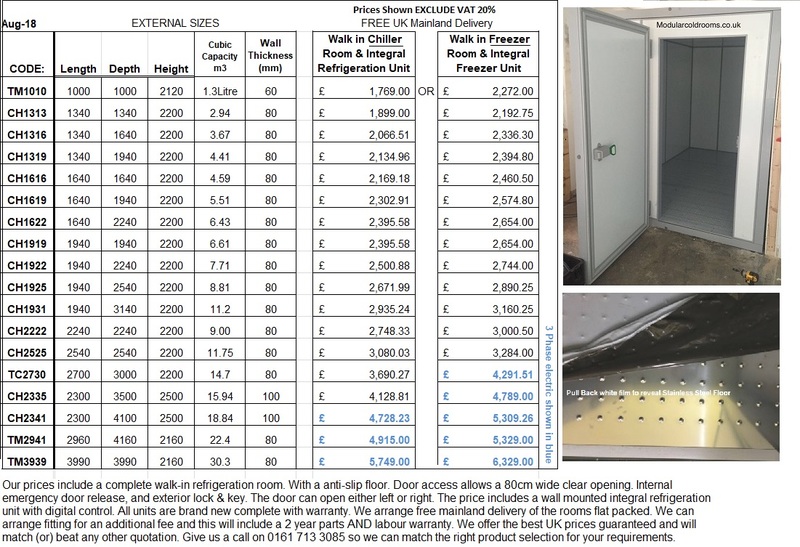 Hinged door with an opening clearance of 800(w) includes internal emergency door release and a external handle on the door with a lock and key. You then get to choose between a refrigerated wall-mounted unit, or the freezer wall mounted unit. On the freezer unit, a door heater is provided. Both rooms also come complete with an internal light. On both rooms, you get the assembly kit to fit together including silicone. Light is included! The wall mounted unit refrigeration system is only recommended for conditions that do not exceed an ambient temperature of +30. Check if this is okay. Do you have ventilation/windows? The room should not be within 1 meter of any direct source of heat. This is a plugin play system that would just plug into the wall 230v. ( If the price is highlighted in blue, this means it is 400V) If you have limited ventilation, then please call 0161 713 3085 for a quotation on a remote split system. All sizes quoted above on the price list, are external sizes. Check first to ensure that panels will fit into your premises, Ensure that you have measured your space correctly. Allow a clearance space of at least 10cm from the coldroom to the wall, and at least 30cm from the top of the ceiling ( to allow the roof panels to be fitted). The largest panel size can be 1200 wide x 2200 so be sure to check that the panels will fit through any corridors. The rooms come complete with an anti slip , a pedestrian floor that is designed for pedestrians and shelf only ( not suitable for pallets or heavy wheels) The room should be fitted on a concrete flat floor completely level with no bumps or cracks. No protrusions should be present as this will hinder the installation. 80mm depth. Panel sheathing: polymer-coated steel. We can deliver within 4 -5 working days to any UK mainland delivery address FREE OF CHARGE! However, we charge a delivery fee to cover some Scotland Zones and the highlands and other remote areas. Delivery is kerb side. Due to the size of some of these panels, assistance with offloading is sometimes required. We can confirm this at the point of sale based on the size and type of delivery. (Offer subject to stock availability - All Brand new with a factory warranty. Prices shown exclude shelving & installation.